Formerly titled “Climate Change and Wisconsin’s Great Lakes,” the page on the site used to correctly assert that “human activities that increase heat–trapping (‘green house’) gases are the main cause” of climate change. 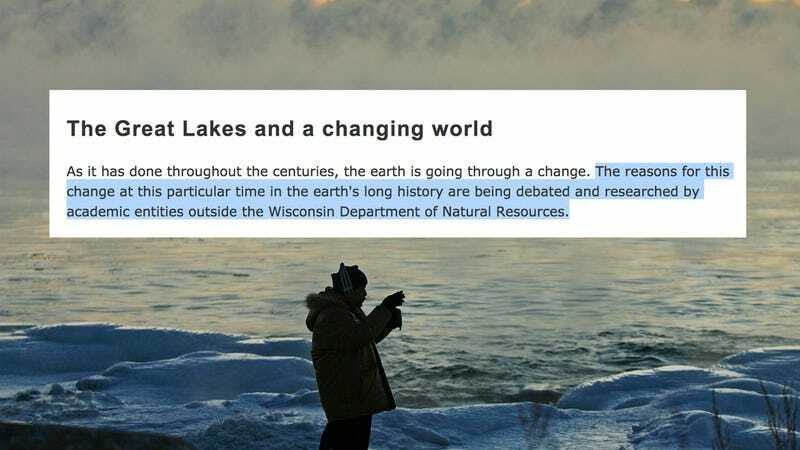 The Wisconsin DNR also deleted two other pages from its site with information about climate change. The page used to include a link to a climate change activity guide for middle and high school students, which has also been removed. Deleting the education guides from the site is especially sinister—how are we going to teach the next generation how to care for our earth if our government doesn’t want them to know what’s actually happening? As you know the causes and effects of any changes in climate are still being debated and research on the matter is being done in academic circles outside DNR. 2017 is looks more bleak than ever.